I was completely terrified to go on this. I hate both roller coasters and dark rides. I was completely amazed at this ride. I LOVED it!!! My throat hurt from screaming, but the ride was awesome! O.K though, but in my opinion not worth all the hype it got. An obvious attempt at a copy of Indie but Universal didnt manage it. This is definately the best ride at the studios and tied with Spiderman for the best ride at the entire Universal Orlando resort. Great theming... and I was suprised at how intense the fast parts actually were. I thought the &quot;fake ending&quot; could have been a little more convincing, though, and I just wish it was just a little bit longer. 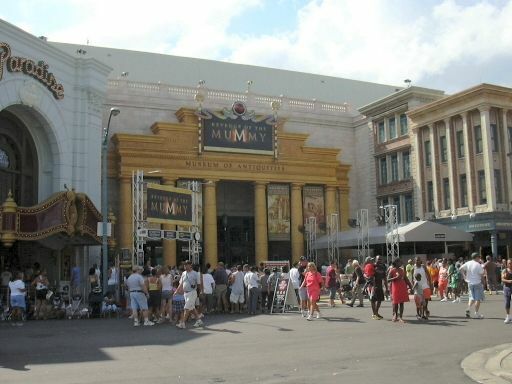 The Mummy is a great hybrid ride. It combines the thrill ofa coaster, and the theme of a dark ride. Its sort of short, but really packs a punch! The fire effects are flawless and astonishing. You go forwards, backwards sideways, up, down, and everywhere else in between! I think too many of you reviewers of this ride were expecting the best of both worlds, a great dark themed ride and a great coaster. This ride honestly is probably neither of those. It is a good coaster and a very good dark themed ride. I enjoyed the coaster sections of the ride because of the launches, quick turns, and visual effects. I think it was a very good theme ride because of the great themed queue with interactive sections, the amazing fire effects, and all seats were good seats to see the action. This is a state of the art ride that you cannot find anywhere else. Hopefully, there will be more like it in the near future that build off of the solid idea that the Mummy has initiated. I beleive this is one of THE BEST rides I have been on in a long time. The animatronics are amazing. What I thought was really neat is how the track actually rotates 180* to shoot you off. Another cool thing is the roof catching on fire at over 1million degrees. Im glad that they replaced kong with this. (Not that nothing was wrong with kong, but Im glad it was this ride that replaced it.) The theming is GREAT and the ending is quite funny. This is one of the best rides in the entire park. The themeing is incredible and the ride is nothing like you would expect while you wait in line. The surprise is what really takes your breath away. You begin slowly going through a show on your "train" (which you dont really know it is until later- unless someone has already told you it is a coaster) and then things start getting faster and faster and not so much a show, but more a ride until, you unexpectedly take off through the coaster part. Its very intense and still themed. The darkness and the effects make it even better. Its an exhilerating ride with unexpected twists and turns and I love the false ending. Its must if you go to Universal. Though after riding it the first time, you know what to expect and it loses its touch a little with each reride. Revenge of the Mummy was one ride that I didnt expect would give me as great of a ride as it did. After researching about it, I thought that the ride would be very boring & slow, but man was I wrong. The theming for its one of the best themes that Ive ever seen on a coaster, & the ride had a great story to it too. Now for the ride. I rode it in the back seat, & the ride experience was something else. Revenge of the Mummy had some great airtime on some of the drops & the scenery around it was truly awe-inspiring. Overall, dont underestimate Revenge of the Mummy like I did at first. Itll leave you w/a lot of surprises & youll want to ride it time & time again. Although the rides short, definitely make an attempt to ride this when youre at USF as its the only major coaster at USF. You definitely wont be disappointed. This ride did a good job combining something like Spiderman and Rock n Roller Coaster. Minus the loops and simulated fall. It has a great storyline, and the trains and whole ride are well themed throughout. The roller coaster part is great as well as the false ending. I really wasnt expecting that slight launch in the beginning of the roller coaster part. Perhaps one point off the for the poorly done scarab beetle effect. Other than that, a great ride in every respect.